Not to be confused with the Edgar Brandt, modernist, Marianne Brandt, born in Chemnitz in 1893 as Marianne Liebe, became a Bauhaus metalist whose name and design innovations rank among those of Marcel Breuer, Mies van Der Rohe and Walter Gropius. She started out as a painter, studying from 1911 to 1918 at the Hochschule fur Bildende Kunst in Weimar, and did a brief stint as a freelance painter before marrying the Norwegian painter Erick Brandt in 1919. The couple lived in Norway and the South of France until 1922. In 1923 Marianne Brandt and her husband moved to Weimar but Erik Brandt returned alone to Norway the same year although the Brandt’s did not divorce until 1935. Abandoning painting Marianne Brandt destroyed most of her paintings and drawings and at the age of 32, in 1924 she joined the Weimar Bauhaus. She was a woman determined to succeed by breaking through barriers that barred women Marianne Brandt became the first woman to head of the metal workshop at the Weimer Bauhaus in 1928. Brandt’s designs for household objects such as lamps, ashtrays and teapots are considered the harbinger of modern industrial design. The famous glass and steel educational complex were Marianne Brandt studied was brilliantly Bauhaus: Form follows function. It became the icon of Modernism, of the International Style. The workshops were the core curriculum, even for master artists and out of them came daily objects at affordable prices. She became a student of Hungarian modernist theorist and designer Laszlo Moholy-Nagy who realized what a talented designer Marianne Brandt was and nurtured her gifts and admitted her to the metalworking workshop. Brandt was one of the few women to have excelled in the man’s world of design. Until her arrival at the Bauhaus, women students had been forced to study ceramics or weaving but thanks to her mentor, Moholy-Nagy, she was the first woman to be admitted into the male bastion of the metal workshops. In the metal workshop Marianne quickly rose to the position of workshop assistant. The years 1924-1929 saw Marianne Brandt design numerous utilitarian objects and lamps. She eventually succeeded Moholy as the workshop’s director in 1928 and in the post she negotiated some of the most important Bauhaus contracts for collaborations with industry, launching some of her lamp deigns on a mass-produced basis, mainly for the lighting firm of Korting & Mathiesen in Leipzig and also Schwintzer & Graff in Berlin. 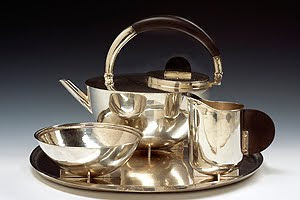 Perhaps the most stunning of her accomplishments of hand wrought designs is an exceptionally rare silver and ebony tea service which exemplifies the best of the German Bauhaus’s modernist aesthetics and functional ideals. The tea service pictured here rejects ornamentation for simple geometric forms like cylinders, spheres and hemispheres. It also reveals the famed school’s emphasis on function: the push-on lid of the teapot, placed away from the spout, does not drip, and the wood knobs provide heat-resistant grips. The teapot was one of several prototypes designed and made by Brandt, when she was a student, and later a teacher in the Bauhaus metal workshop. After leaving the Bauhaus for Berlin in 1929, Brandt was briefly employed by Walter Gropius’ architecture practice in Berlin. She designed mass-produced and modular furniture for the interiors of the public housing project in Karlsruhe-Dammerstock. She subsequently became head of metal design at the Ruppel firm in Gotha, where she remained until losing her job in the midst of the ongoing financial depression in 1932. During the l930s, when Gropius and Moholy and other Bauhauslers fled Nazi Germany, she returned to her hometown of Chemnitz to look after her family. DERIDED AS A ‘DECADENT’ BAUHAUSLER, MARIANNE BRANDT WAS UNEMPLOYABLE UNDER BOTH THE NAZIS AND THE EAST GERMAN COMMUNISTS AFTER WORLD WAR II. SHE REMAINED ISOLATED ON THE ICY SIDE OF THE IRON CURTAIN UNTIL HER DEATH IN 1983. SOME OF HER BAUHAUS DESIGNS HAVE EVEN GONE INTO PRODUCTION, BUT SADLY NOT THE TEAPOT SERVICE. MARIANNE BRANDT WAS OFTEN OVERLOOKED BUT TODAY SHE IS RECEIVING HER DUE RECOGNITION AS A MAJOR BAUHAUSLER AND CELEBRATED ALONG WITH WALTER GROPIUS, MARCEL BREUER, MIES VAN DER ROHE. SHE WAS A MODERN WOMAN AHEAD OF HER TIME AND BROKE THROUGH THE MALE BASTIAN IN METAL CRAFSMANSHIP IN 1924. Never underestimate the power of the mighty pen. 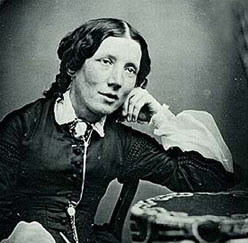 Harriet Beecher Stowe the author of the anti-slavery novel, “Uncle Tom’s Cabin” it is said helped prompt the start of the American Civil War. Little did she know that her destiny would be forged in raising awareness of the plight of African-American salves during the 19th century. Harriet Elizabeth “Hattie Beecher was born 200 years ago on June 14, 1811 in Litchfield, Connecticut the sixth of 11 children into a family of powerful and very demanding individuals. The foundation of family values, social service and activism was at the gore of her upbringing. She was a woman progressive in her values and ideals and was determined to succeed. In an era when most women were not formally educated she and her sisters were educated and devoutly Christian. All of her brothers like their father, Lyman Beecher, a fiery, Evangelical Calvinist, became ministers and her sisters were both pioneers in advancing women’s education and voting rights. Harriet choose to do it through the powerful written words of activism. AN AUTHOR EMERGES In 1832 Harriet’s family moved to Cincinnati, Ohio, when her father was made the president of the Lane Theological Seminary. It was at this time that Harriet made her first attempts at writing fiction and her writing career was well underway with the publication of two novels before her marriage in 1836 to theology professor Calvin Stowe. The couple opposed slavery and was active in the abolitionist movement and housed runaway slaves from the south and assisted the Underground Railroad. During this time they had seven children but it was the death of her toddler child that inspired Stowe to write about slavery. With a mother’s heart torn by the loss of her child she sympathized with the slave mothers who were forced to give up their children to be sold. She also had the opportunity to visit the South and observed the operation of the slave system there. The riveting details of this trip further fueled her pen. UNCLE TOM’S CABIN Harriet’s husband Calvin Stowe was called to a position at Bowdoin College in Brunswick, Maine where Harriet set about writing Uncle Tom’s Cabin. The action of the book traces the passage of the slave Uncle Tom through the hands of three owners, each meant to represent a type of Southern figure, the last being the wicked Simon Legree, who causes the death of Uncle Tom. The successful dash for freedom taken by Georg and Eliza is the high point of the book. The story was first conceived as installments and appeared in serial form from 1851 to 1852 in the National Era, a Washington, D.C. anti-slavery newspaper. Harriet wrote more than 40 installments but the book was published in 1852 in a two-volume edition by the house of John P. Jewett. It sold three hundred thousand copies in its first year and a best seller worldwide. Harriet Beecher Stowe published more than 30 books in her lifetime but she is best known for a crusading sense of social and political responsibility. Uncle Tom’s Cabin remains a classic product of the culture of her time and made her one of the most widely known American women wrtiers of the 19th century. In later life she returned to her home state, where she died on July 1, 1896 at age 85 in Hartford, Connecticut. Who would have thought that in a male-dominated fashion world of the, 1900s Lucy Christina Sutherland would emerge as the designer, “Lucile,” a couture designer of international prestige. Born in 1863, she and her sister, the future romantic novelist Elinor Glyn, were pioneers who paved the way determined to succeed beyond expectations of women of their era. She survived a lackluster childhood in Canada and the Isle of Jersey, legal actions and business reversals and assorted marital problems the magnitude of such that would have challenged any modern woman to give up. Not, Lucile, she was independent and resourceful, but sadly she is unfortunately immortalized as the cold, imperious woman who, with her husband, Sir Cosmo, survived the terrible ending of the maiden voyage of the Titanic. However, Lucile is a powerful and unforgettable woman in history of fashion. Nonetheless, through her imagination and talent, she helped to lay the foundation for today’s couture and ready-to-wear markets, and the impact of fashion on society. DESIGNING WOMAN In 1884 Lucy married a well-heeled but eccentric alcoholic Scot, James Stuart Wallace who after several years of marriage abandoned Lucy and their young daughter Esme to a life of genteel poverty. In a move that presaged her innate audacity and independence, Lucy separated from and then divorced Wallace and moved to London. After a stint of dressmaking at home, the self-reliant Lucy started out in 1890 by dressmaking for her friends. It was the era of Aestheticism and her clients hoped to appear “artistic” and Lucy was ready for the task. She designed what she called “personality dresses” which allowed each woman’s individuality to shine. THE HOUSE OF ‘LUCILE’ Lucy’s fashions were utterly different and like Poiret, she honed in on what women craved in their attire producing romantic, sensual gowns, innovative at the time, such as draped skirts that revealed the legs. Utterly feminine lingerie was full of the frou-frou, silks and lace so popular during the Edwardian era. Her specialty was picturesque tea gowns in diaphanous layers of pastel silk called, “dream dresses” with names like “Birth of Venus,” worn unrestricted with mild corsetry. Her success blossomed and she opened her fashion house, Maison Lucile in 1890. Like Charles Frederick Worth Lucile held mannequin parades. However, she created over the top fashion shows into a stage productions, complete with mood-lighting, music, little gifts and programs. Customers were invited to watch the catwalk sipping tea and cookies while Lucile announced her ‘emotional gowns’ which were influenced by literature, history and the personality of her clients. The models were gorgeous, statuesque and beautiful and became sought-after as Gaiety Girls. EXPANDING LUCILE HORIZONS Lucile was becoming quite a wealthy woman. In 1903 her business was incorporated as “Lucile, Ltd” and she took on Sir Cosmo Edmund Duff Gordon, a dashing aristocrat as a partner in a shrewd business move. They married in Venice in 1900 and Sir Cosmo's keen business sense helped Lucile to expand her horizons. She opened branches in New York and Chicago. Despite French colleague warnings, “Nobody but a Frenchwoman knows how to dress,” her Paris Maison was prosperous. Madame Lucile was a keen business woman and licensed her name to Sears, Roebuck & Co. for a two-season lower-priced, mail-order fashion line. Lucile was on a high and began writing a weekly column for the New York Examiner. She also designed for the entertainment world designing costumes that became famous fashions, such as those for Lily Elsie, star of the smash-it operetta, The Merry Widow, the brightest light of the 1907 season and the large picture hat reminiscent of those of the 1780s, swept though fashionable society. Lucile also counted among her private clients the actress Sarah Bernhardt and the dancer Irene Castle. LEGAL ACTION and LUCILE In 1917 Lucile was embroiled in the case Wood v. Lucy, Lady Duff-Gordon, wherein the Judge stripped her of the use of her own name after she contracted the sole right to market her name to her advertising agent. Shortly thereafter the House of Lucile began to collapse. By pre-WWI the name Lucile and the inspiration of its namesake designer were considered old-fashioned and démodé. Unable to adjust to changing fashion sensibilities and suffering from financial difficulties Lucile folded by the end of the 1920s. However, Lady Duff Gordon remained influential as a fashion columnist but her former success proved elusive. 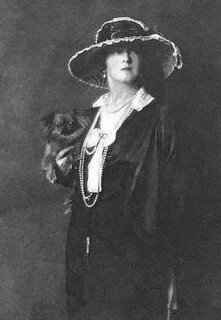 After penning her florid and discreet memoirs, Discretions and Indiscretions, in 1932, Lady Duff Gordon died three years later at the age 71. ABOUT THE TITANIC Urgent business required Lucile to travel with haste and although she had been reluctant to sail on the first crossing of the Titanic her fears were overcome when the booking agent reassured her, “Why the boat is absolutely unsinkable.” Lucile’s concerns were not without merit for as history tells the Titanic struck an iceberg on April 14, 1912. Legend has it that the Duff Gordon’s made their way onto Lifeboat 1, which could have accommodated 40 people, but held only 12 passengers when lowered into the water. The actions of Duff Gordon were viewed with suspicion when it was revealed that he tried to bribe the oarsmen to ignore drowning passengers as the boat that he and Lucy were in rowed swiftly away from the wreckage. She further drew the ire of her fellow passengers by complaining about her ruined nightdress when other people were dying. However, later in London, an official inquiry pronounced the charges unfounded.